Many shooters are fans of the steel-framed CZ-75, but how does the polymer-framed CZ P07 stack up? I know a lot of savvy gun people who are big fans of CZ pistols, but they focus on the metal-framed CZ-75s, for the most part, and ignore the polymer-framed CZ P07. That’s a shame, because it’s a heck of a pistol for a good price, and it’s just recently been updated. CZ did things a bit backward with the CZ P07. Normally, a company introduces a full-size gun, then starts cutting it down to offer compact/carry versions. CZ started with the P07 Duty, which is big enough for a duty gun and yet small enough to conceal. It was several years later when the company offered a “full-size” version of the CZ P07, the P-09, with some enhancements and improvements. Well, those design improvements have made their way down to the CZ P07. The pistol ships with a decocker installed, with the option of changing to a manual safety, which is included in the box. The author dislikes this particular safety and recommends keeping the decocker. The first thing I noticed is that it is now simply the CZ P07. CZ dropped the “Duty” from the name, perhaps realizing who the target market really is. There are a heck of a lot more private citizens buying guns in America than cops. 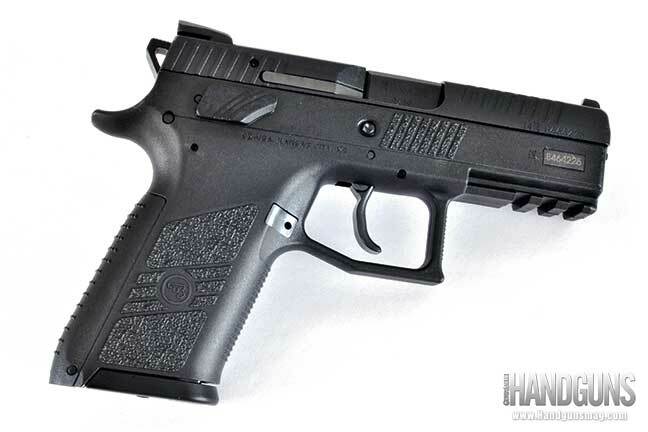 This is a hammer-fired, polymer-frame pistol slightly larger and heavier than a Glock 19. It is offered in 9mm and .40 S&W, and I was shipped a 9mm model for testing. It features a 3.8-inch barrel and weighs just over 27 ounces empty. It’s a double-action/single-action gun as it comes from the factory, but in its case you’ll find a manual safety that allows you to convert it to single-action-only. The pistol comes standard with photo-luminescent three-dot sights. The slide is relatively minimalist, so CZ has added front grasping grooves for ease of operation. The bore axis is very low, which results in a controllable gun with little muzzle rise. As part of the upgrade, the CZ P07 now comes with interchangeable backstraps—small, medium and large—with slots in the case foam for the ones you’re not using. I wish the backstraps had more texturing on them, but that is a minor complaint, and the rest of the frame has decent patterning. The frame above the front of the trigger guard is also textured; this is where the thumb of your support hand will press if you have a proper two-handed grip. With its iconic humpbacked frame, the CZ-75 has always been known for its ergonomics, and the CZ P07 shares that. It feels good in the hand. With its very low bore it was very comfortable to shoot, with minimal muzzle rise and felt recoil. The shape of the trigger has been slightly flattened on the new model, and the hammer has been reshaped to reduce the chance of snagging. Also, the pistol has been given forward cocking serrations. Considering how minimalist the slide profile is on this gun, I’ll take any extra gripping area I can get. The slide also has a new nitride finish that is supposed to wear longer and be more corrosion resistant. The pistol ships with three interchangeable backstraps, and though the author wishes there was more checkering or stippling on them, the rest of the grip offers sufficient purchase. The CZ P07 comes with two magazines, and I discovered they were 15-rounders as opposed to the 16-round mags that came with the original CZ P07 Duty. Checking with CZ’s Zach Hein, I learned that the factory updated the magazine to increase longevity for the .40 version. Between the larger diameter spring and a different base plate retainer, capacity in the 9mm dropped by one. However, that means the new CZ P07 will be legal for sale in New Jersey and Colorado. Old CZ P07 Duty magazines will work just fine in the new pistol. Every CZ P07 and P09 pistol I’ve ever fired has had a great double-action trigger. This pistol? Not so much. It was a bit gritty and at 10.5 pounds noticeably heavier than I was expecting. That said, after take-up the trigger travel in double action with the hammer starting in the decock notch was only .65 inch, which is very short. Because of that short travel I was able to shoot this pistol better than I would have expected. The single-action pull was four pounds even, with a long take-up and an almost imperceptible break. When I heard that CZ was introducing a “new and improved” version of the CZ P07 Duty, I hoped the company would change my only complaint on the original: a manual safety that was so flat it was hard to work holding the pistol at any angle and nearly impossible, with a firing grip on the pistol, to get on and off using your thumb. Unfortunately, the updated P07 retains that same manual safety. Therefore, while I would rather carry a cocked-and-locked single-action pistol than a DA/SA model, I wouldn’t recommend replacing the decocker on the P07 with the provided manual safety. My issues with the nearly useless manual safety aside, I really like the CZ P07. It looks good, feels good in the hand, is reliable and accurate, has a good trigger and holds all sorts of ammo. 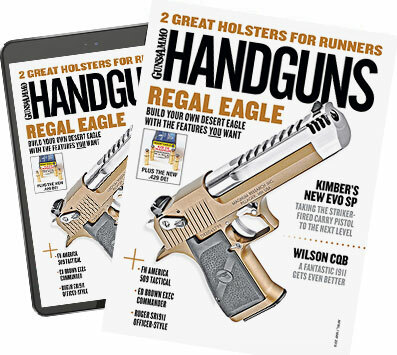 Best of all, with a suggested retail of only $510, it is noticeably less expensive than many of its polymer pistol competitors.